Well...We have finally made it to the most important part of any operating system: The Kernel. We have heard this term alot so far throughout the series, already. The reason is because of how important it really is. The Kernel is the Core of all operating systems. Understanding what it is and how it effects the operating system is important. In this tutorial, We will look at what goes behind Kernels, what they are, and what they are responsible for. Understading these concepts is essental in coming up with a good design. The Kernel is the core component of an operating system. Okay, but what does this mean for us? What exactally is an OS Kernel, and why should we care for it? There is no rule that states a kernel is mandatory. We can easily just load and execute programs at specific addresses without any "kernel". In fact, all of the early computer systems started this way. Some modern systems also use this. A notable example of this are the early counsole video game systems, which required rebooting the system in order to execute one of the games designed for that console. So, what is the point of a Kernel? In a computing envirement, it is impractical to restart every time to execute a program. This will means that each program itself would need its own bootloaders and direct hardware controlling. After all, if the programs need to be executed at bootup, there would be no such thing as an operating system. What we need is an abstraction layer to provide the capability of executing multiple programs, and manage their memory allocations. It also can provide an abstraction to the hardware, which will not be possible if each program had to start on bootup without an OS. After all, the software will be running on raw hardware. The Kernel provides the primary abstraction layer to the hardware itself. The Kernel is useually at Ring 0 because of this very reason: It has direct control over every little thing. Because we are still at Ring 0, we already experenced this. This is good--but what about other software? Remember that we are deveoping an operating envirement? Our primary goal is providing a safe, and effective envirement for applications and other software to execute. If we let all software to run at Ring 0, alongside the Kernel, there would be no need for a kernel, would there be? If there was, The ring 0 software may conflict with the ring 0 Kernel, causing unpredictable results. After all, they all have complete control over every byte in the system. Any software can overwrite the kernel, or any other software without any problems. Ouch. Yet, that is only the beginning of the problems. It is impossible to have multitasking, or multiprocessing as there is no common ground to switch between programs and processes. Only one program can execute at a time. The basic idea is that a Kernel is a neccessity. Not only do we want to prevent other software direct control over everything, but we want to create an abstraction layer for it. Understanding where and how the Kernel fits in with the rest of the system is very important. Software has alot of abstractions. All of these abstractions is ment to provide a core and basic interfaces to not only hide implimentation detail, but to shield you from it. Having direct control over everything might seem cool--but imagine how much problems would be caused by doing this. You might be curious as of what problems I am referring to. Remember that, it its core, electronics does only what we tell it. We can control the software down to the hardware level, and in some cases, electronics level. Making a mistake at these levels can physically cause damage to those devices. Lets take a look at each abstraction layer to understand what I mean, and to see where our Kernel fits in. In Bootloaders 3 Tutorial, we have took a detailed look at the Rings of Assembly Language. We also looked at how this related to protected mode. Remember that Ring 0 software has the lowest protection level. This means that we have direct control over everything, and are expected to never crash. If any Ring 0 program was to crash, it will take the system down with it (Triple Fault). This is the actual physical component. The actual microcontroller chips on the motherboard. They send low level commands to other microcontrollers on other devices that pysically control this device. How? We will look at that in Level 2. Examples of hardware are the microcontroller chipset (The "Motherboard Chipset'), disk drives, SATA, IDE, hard drives, memory, the processor (Which is also a controller--Please see Level 2 more more information). This is the lowest level, and the most detailed as it is pure electronics. The Firmware sets ontop of the electronics level. It contains the software needed by each hardware device and microcontroller. One example of firmware is the BIOS POST. Remember the processor itself is nothing more then a controller--and just like other controllers, rely on its firmware. The Instruction Decoder within the processor dissects a single machine instruction into either Macrocode, or directly to Microcode. Please see the Tutorial 7: System Architecture Tutorial for more information. Firmware is useually developed using microcode, and either assembled (With a microassembler) and uploaded into a storage area (Such as the BIOS POST), or hardwired into the logic circuits of the device through various of means. Microcode is useually stored within a ROM chip, such as EEPROM. Microcode is very hardware specific. Whenever there is a new change or revision, a new Microcode instruction set and Microassembler needs to be developed. On some systems, Microcode has been used to control individual electronic gates and switches within the circuit. Yes, It is that low level. Microcode is very low level, and can be very hard to develop with, espically in complex systems, such as a microprocessor or CPU. It also must be reimplimented whenever a change happens--Not only the code, but the Microprograms as well. Because of this, some systems have implimented a more higher level language called Macrocode ontop of Microcode. Because of this abstraction layer, Macrocode changes less frequently then that of Microcode, and is more portable. Also, do to its abstraction layer, is more easier to work with. It is still, however, very low level. It is used as the internal logic instruction set to convert higher level machine language into Microcode--which is translated by the Instruction Decoder. This is where we are at. The Stage 2 Bootloaders only focus was to set everything up so that our Kernel has an envirement to run in. Our Kernel provides the abstraction between Device Drivers and Applications software, and the firmware that the hardware uses. Device Drivers go through the Kernel to access the hardware. Device Drivers need alot of freedom and control because they require direct control over specific microcontrollers. Having to much control, however, can crash the system. For example, what would happen if a driver modified the GDT, or set up its own? Doing so will immediately crash the kernel. Because of this, we will want to insure these drivers cannot use LGDT to load its own GDT. This is why we want these drivers to operate at either Ring 1 or Ring 2--Not ring 0. For an example, a Keyboard Device Driver will need to provide the interface between Applications software and the Keyboard Microcontroller. The driver may be loaded by the Kernel as a library providing the routines to indirectly access the controller. As long as there is a standard interface used, we can provide a very portable Kernel as long as we hide all hardware dependencies. This is where the software are at. They use the interfaces provided by the System API and Device Driver interfaces. Normally they do not access the Kernel directly. This Series will be developing the drivers during the development of the Kernel. This will allow us to keep things object orianted, and provide abstraction layer for the Kernel. Because the Kernel is the Core component, it needs to provide the management for everything that relys on it. The primary purpose of the Kernel is to manage system resources, and provide an interface so other programs can access these resources. In alot of cases, the Kernel itself is unable to use the interface it provides to other resources. It has been stated that the Kernel is the most complex and difficault tasks in programming. This implies that designing and implimenting a good Kernel is very difficault. In Tutorial 2 we took a brief look at different past operating systems. We have bolded alot of new terms inside that tutorial--and have compilied a list of those terms at the end of the tutorial. This is where that list starts getting implimented. Some of the above can be implimented as seperate drivers, used by the Kernel. For example, Windows uses ntfs.sys as an NTFS Filesystem Driver. This list should look familiar from Tutorial 2. We have also covered some of these terms. Lets look at the bolded terms, and see how they relate to the Kernel. We will also look at some new concepts. This is quite possibly the most important part of any Kernel. And rightfully so--all programs and data require it. As you know, in the Kernel, because we are still in Supervisor Mode (Ring 0), We have direct access to every byte in memory. This is very powerful, but also produces problems, espically in a multitasking evirement, where multiple programs and data require memory. One of the primary problems we have to solve is: What do we do when we run out of memory? Then there is the problems of where each program is loaded at. Each program will be required to be Position Indipendent or provide relocation Tables. Without this, we will not know what base address the program is supposed to be loaded at. Lets look at these deeper. Remember the ORG directive? This directive sets the location where your program is expected to load from. By loading the program at a different location, the program will refrence incorrect addresses, and will crash. We can easily test this theory. Right now, Stage2 expects to be loaded at 0x500. However, if we load it at 0x400 within Stage1 (While keeping the ORG 0x500 within Stage2), a triple fault will accure. This adds on two new problems. How do we know where to load a program at? Coinsidering all we have is a binary image, we cannot know. However, if we make it standard that all programs begin at the same address--lets say, 0x0, then we can know. This would work--but is impossible to impliment if we plan to support multitasking. However, if we give each program there own memory space, that virtually begins at 0x0, this will work. After all, from each programs' perspective, they are all loaded at the same base address--even if they are different in the real (physical) memory. What we need is some way to abstract the physical memory. Lets look closer. A Virtual Address Space is a Program's Address Space. One needs to take note that this does not have to do with System Memory. The idea is so that each program has their own independent address space. This insures one program cannot access another program, because they are using a different address space. Because VAS is Virtual and not directly used with the physical memory, it allows the use of other sources, such as disk drives, as if it was memory. That is, It allows us to use more memory then what is physically installed in the system. Virtual Memory is a special Memory Addressing Scheme implimented by both the hardware and software. It allows non contigous memory to act as if it was contigius memory. 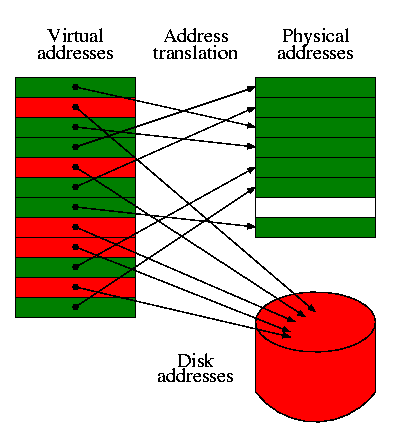 Virtual Memory is based off the Virtual Address Space concepts. It provides every program its own Virtual Address Space, allowing memory protection, and decreasing memory fragmentation. Virtual Memory also provides a way to indirectly use more memory then we actually have within the system. One common way of approching this is by using Page files, stored on a hard drive. Each memory "Block" is known as a Page, which is useually 4096 bytes in size. Once again, we will cover everything in much detail later. The MMU, Also known as Paged Memory Management Unit (PMMU) is a component inside the microprocessor responsible for the management of the memory requested by the CPU. It has a number of responsibilities, including Translating Virtual Addresses to Physical Addresses, Memory Protection, Cache Control, and more. Segmentation is a method of Memory Protection. In Segmentation, we only allocate a certain address space from the currently running program. This is done through the hardware registers. Segmentation is one of the most widly used memory protection scheme. On the x86, it is useually handled by the segment registers: CS, SS, DS, and ES. We have seen the use of this through Real Mode. THIS will be important to us. Paging is the process of managing program access to the virtual memory pages that are not in RAM. We will cover this alot more later. THIS is where the ring levels start getting important. As you know, Our Kernel is at Ring 0, while the applications are at Ring 3. This is good, as it prevents the applications direct access to certain system resources. This is also bad, as alot of these resources are needed by the applications. You might be curious on how the processor knows what ring level it is in, and how we can switch ring levels. The processor simply uses an internal flag to store the current ring level. Okay, but how does the processor know what ring to execute the code in? This is where the GDT and LDT become important. As you know, in Real Mode, there is no protection levels. Because of this, everything is "Ring 0". Remember that we have to set up a GDT prior to going into protected mode? Also, remember that we needed to execute a far jump to enter the 32 bit mode. Lets go over this in more detail here, as they will play very important roles here. Ring 0 is known as supervisor mode. It has access to every instruction, register, table, and other, more privedged resources that no other applications with higher ring levels can access. Supervisor Mode utilizes a hardware flag that can be changed by system level software. System level sftware (Ring 0) will have this flag set, while application level software (Ring 3) will not. There are alot of things that only Ring 0 code can do, that Ring 3 code cannot. Remember the flags register from Tutorial 7? The IOPL Flag of the RFLAGS register determins what level is required to execute certain instructions, such as IN and OUT instructions. Because the IOPL is useually 0, this means that Only Ring 0 programs have direct access to hardware via software ports. Because of this, we will need to switch back to Ring 0 often. Kernel Space referrs to a special region of memory that is reserved for the Kernel, and Rng 0 device drivers. In most cases, Kernel Space should never be swapped out to disk, like virtual memory. If an operating software runs in User Space, it is often known as "Userland". This is normally the Ring 3 application programs. Each application useually executes in its own Virtual Address Space (VAS) and can be swapped from different disk devices. Because each application is within their own virtual memory, they are unable to access another programs memory directly. Because of this, they will be required to go through a Ring 0 program to do this. This is neccessary for Debuggers. Applications are normally the least priveldged. Because of this, they useually need to request support from a ring 0 Kernel level software to access system resources. What we need is a way so that these applications can query the system for these resources. However, to do this, we need to be in Ring 0, Not Ring 3. Because of this, we need a way to switch the processor state from Ring 3 to Ring 0, and allow applications to quey our system. A directed instruction, such as a far jump, far call, fat ret etc. A trap instructon, such as INT, SYSCALL, SYSEXIT, SYSENTER, SYSRETURN etc. So...In order for an application to execute a system routine (while switching to Ring 0), the application must either far jump, execute an Interrupt, or use a special instruction, such as SYSENTER. This is great--but how does the processor know what ring level to switch into? This is where the GDT comes into play. Remember that, in each descriptor of the GDT, we had to set up the Ring Level for each descriptor? In our current GDT, We have 2 descriptors: Each for Kernel Mode Ring 0. This is our Kernel Space. All we need to do is to add 2 mode descriptors to our current GDT, but set for Ring 3 access. This is our User Space. ; Null descriptor (Offset: 0x0)--Remember each descriptor is 8 bytes! Notice what is happening here. All code and data have the same range values--the only difference is that of the Ring levels. As you know, protected mode uses CS to store the Current Privilege Level (CPL). When entering protected mode for the first time, We needed to switch to Ring 0. Because the value of CS was invalid (From real mode), we need to choose the correct descriptor from the GDT into CS. Please see Tutorial 8 for more information. This required a far jump, as we needed to upload a new value into CS. By far jumping to a Ring 3 descriptor, we can effectivly enter a Ring 3 state. As, as you know, we can use a INT, SYSCALL/SYSEXIT/SYSENTER/SYSRET, far call, or an exception to have the processor switch back to Ring 0. The program relies on the System API to access system resources. Most applications refrence the System API directly, or through their language API--Such as the C runtime library. The System API provides the Interface between applications and system resources through System Calls. A Software Interrupt is a special type of interrupt implimented in software. Interrupts are used quite often, and rely on the use of a special table--the Interrupt Descriptor Table (IDT). We will look at Interrupts alot more closer later, as it is the first thing we will impliment in our Kernel. Linux uses INT 0x80 for all system calls. Interrupts are the most portable way to impliment system calls. Because of this, we will be using interrupts as the first way of invoking a system routine. Call Gates provide a way for Ring 3 applications to execute more prividged (Ring 0,1,2) code. The Call gate interfaces between the Ring 0 routines and the Ring 3 applications, and is normally set up by the Kernel. Call Gates provide a single gate (Entry point) to FAR CALL. This entry point is defined within the GDT or LDT. It is much easier to understand a call gate with an example. The above is an example of a call gate. Call Gates are not used too often in modern operating systems. One of the reasons is that most architectures do not support Call Gates. They are also quite slow as they require a FAR CALL and FAR RET instructions. On systems where the GDT is not in protected memory, it is also possible for other programs to create their own Call Gates to raise its protection level (and get Ring 0 access.) They have also been known to have security issues. One notable worm, for example, is Gurong, which installs its own call gate in the Windows Operating System. These instructions were introduced from the Pentium II and later CPUs. Some recent AMD processors also support these instructions. SYSENTER can be executed by any application. SYSRET can only be executed by Ring 0 programs. These instructions are used as a fast way to transfer control from a User Mode (Ring 3) to a Privildge Mode (Ring 0), and back quickly. This allows a fast and safe way to execute system routines from user mode. These instructions directly rely on the Model Specific Registers (MSR's). Please see Tutorial 7 for an explination of MSRs, and the RDMSR and WRMSR instructions. This instruction is only used to transfer control from a Ring 3 code to Ring 0. At startup, we will need to set these MSR's to point to a Starting location which will be our Syscall Entry Point for all system calls. Lets take a look at SYSEXIT. Because SYSENTER and SYSEXIT require that the MSR's are set up prior to calling them, we first need to initialize those MSRs. Remember that IA32_SYSENTER_CS is index 0x174, IA32_SYSENTER_ESP is 0x175, and IA32_SYSENTER_IP is 0x176 within the MSR. Remember from tutorial 7? ; provide a single entry point for all system calls. If the code that executes sysenter is at Ring 3, and Sysenter_Entry is at protection level 0, the processor will switch modes within the SYSENTER instruction. in the above code, both are at Protection Level 0, so the processor will just call the routine without changing modes. As you can see, there is a bit of work that must be done prior to calling SYSENTER.\ and SYSEXIT. SYSENTER and SYSEEXIT are not portable. Because of this, it is wise to impliment another, more portable, method alongside SYSENTER/SYSEXIT. What do we do if a program causes a problem? How will we know what that problem is and how to handle it? Normally this is done by means of Exception Handling. Whenever the procesor enters an invalid state caused by an invalid instruction, divide by 0, etc; the processor triggers an Interrupt Service Routine (ISR). If you have mapped our own ISR's, it will call our routines. The ISR called depends on what the problem was. This is great, as we know what the problem is, and can try finding the program that originally caused the problem. One way of doing this is simply getting the last program that you have given processor time to. That is guaranteed to be the one that has generated the ISR. Once you have the programs information, then one can either output an error or attempt to shutdown the program. IRQs are mapped by the internal Programmable Interrupt Controller (PIC) inside the processor. They are mapped to interrupt entrys within the Interrupt Descriptor Table (IDT). This is the first thing we will work on inside the Kernel, so we will cover everything later. We looked at alot of different concepts in this tutorial, ranging from Kernel theory, memory management concepts, Virtual Memory Addressing (VMA), and program management, including seperating Ring 0 from Ring 3, and providing the interface between applications and system software. Whew! Thats alot, don't you think? Alot of the concepts in this tutorial may be new to you--don't worry. This is more of a "Get your feet wet" tutorial, where we cover all of the basic concepts related to Kernels. In the next tutorial, we are going to look at Kernels from another perspective. We will cover some new concepts yet again, and talk about Kernel designs and implimentations. Afterwords, we will start building our compiliers and toolchains to work with C and C++. Sound fun? I am currently using MSVC++ 2005 for my Kernel.